Spambots are small computer programs that scan web pages to identify and save email addresses. These are then collected and added to junk mailing lists, which can result in a website owner receiving large amounts of spam. This can be a major headache for the owner or webmaster of a busy website. To avoid this, you can encrypt the email addresses on your web pages so a spambot cannot identify them. The addresses still appear as normal, and if you use a mailto: link in your code this will still perform as required. Toby Wallis Communications has now introduced an online tool which generates an encrypted version of any email address entered. The encrypted code can then be copied and pasted into any web page, thus creating a spam-proof email link quickly and easily. The encryption tool is available free of charge on the company’s website. 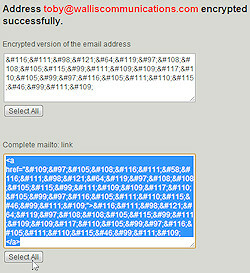 To access the email encryption tool from Toby Wallis Communications visit http://www.walliscommunications.com/encrypt-email.